Memorial Day is long gone and summer is officially here, which means that grilling season is in full swing. If you’re going to be hosting a barbecue and, like me, get frustrated by having half the party out by the grill and the other half inside making pasta salad, try out this fully grilled menu that will bring the whole party out to the back deck. From start to finish, the whole meal tastes like summer. 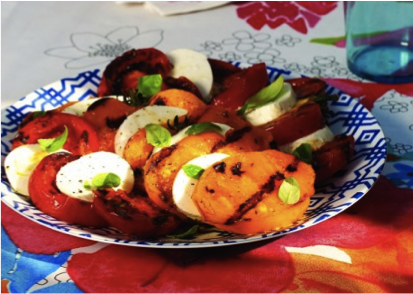 Grilling the tomatoes intensifies their flavor and adds a new twist to the classic Italian appetizer. I was not sure what to expect from warm tomatoes, but this easy trick makes the dish even more delicious and definitely impresses the crowd! It’s my new go-to for “classing up” summer BBQs. Note: Garlic oil is simply oil infused with garlic. If you do not have this, dice 2-3 cloves of garlic and let them sit in olive oil for 10 minutes before brushing the tomatoes. 1. Brush grill grates with oil, and pre-heat grill to medium. Recipe and picture from Vegetarian Times. Note: You can use fillets for this recipe, but the steaks hold together better on the grill. Also, regular garlic can be substituted for black garlic, although the black version is loaded with more antioxidants! 1. Brush grill grates with oil. (Grill should already be pre-heated from the Caprese). 2. In a small bowl, combine garlic, balsamic vinegar, orange zest, freshly squeezed orange juice, sea salt and pepper. 3. Marinate halibut steaks in balsamic mixture for no longer than 10 minutes (or marinade will start to break fish down and make it difficult to grill). 4. Place steaks on grill; cook for 10 minutes or until fish flakes with a fork. 5. Flip steaks halfway through cooking to prevent halibut from falling apart. 6. 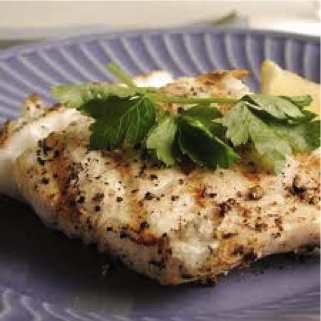 Top with a sprig of fresh cilantro and serve. What says ‘summer’ more than watermelon? Grilling slices of watermelon adds an interesting twist to the typical summer dessert by concentrating the fruit’s flavor and texture. The balsamic vinegar adds a bit of tangy-ness, while the mint and watercress finish it off with a fresh, summery kick. And it’s just as refreshing as its ungrilled counterpart! 1. Brush grill grates with oil; keep on medium heat. 2. Brush watermelon slices with olive oil. Grill watermelon slices 5 minutes, or until just scorched around edges. 3. Whisk together balsamic vinegar and agave nectar in bowl. Toss half of vinegar mixture with watercress in large bowl. 4. Divide watercress salad among 4 plates. Top with grilled watermelon; garnish with mint and remaining vinegar mixture. Ashley Carter recently completed the first year of her Master’s degree in the Nutrition Communication program at the Friedman School. She loves cooking and trying new, interesting recipes, especially when she can be doing it outside with all of her friends!